You must make reservations at least 5 minutes in advance of the time at Aditi Indian Dining - Alexandria. We are a mile and half awaya from Vandorn and Franconia Springfield Metro stops. There are frequent bus routes from these Metro stops to Kingstowne Towne Center in which we are located. Bus to locations are - 321 and 322. Catering for parties ranging from 30 people and above. We also deliver large orders for parties. Aditi, the name of an ancient goddess, symbolizes the cyclical nature of life. The Sanskrit word, Aditi, denotes abundant, joyful & unbroken creative power that sustains the universe. Colloquially, Aditi means ‘distinguished guest’. Aditi Indian Dining’s new & trendy location in Kingstowne boasts of modern decor, great ambience, a cozy bar & an abundant choice of appetizers, entrees & desserts. We also serve a lunch buffet every day. Our menu features a wide range of vegan, vegetarian and non-vegetarian preparations. The menu offers choice for the discerning customer and our team is eager to offer choice on varying spice levels, health & heart friendly foods. We are located in Kingstowne Towne Center across Kingstowne 16 Cinemas in Alexandria and minutes away from all the major highways (395, 95, 495 & Fairfax County Parkway) & close to Vandorn and Springfield Metro. The center also has abundant parking facilities, a large play area for families & is coupled with great shopping. The food was wonderful! Can’t wait to go back. The only disappointment was the garlic naan. Only wanted garlic taste but it was heavily buttered and we couldn’t enjoy it. The meal itself was delicious. Great place, it was our first time. We got there early and Jerry was able to accommodate us. Staff and servers are polite and very attentive to customers. The food was delicious and well worth the money. Jerry noticed we had been waiting for our appetizers to come and brought a complimentary dish to try (spinach wafers?) which was great. Since we were celebrating an anniversary event they also brought complimentary Kulfi in the end which was delicious. Will definitely return for their service and good food. We went to Aditi for a birthday dinner and thoroughly enjoyed our meal and experience. The spinach and brussels sprouts appetizers are amazing, and all of us also very much enjoyed our main dishes. Great service too! I had the tandoori platter. Once again...it was delicious. Can't wait to return. The food was good but the service and price were less than desirable. I had the non-veg thal for dinner. Not only was it delicious but also the portions were generous. I was stuffed! Thank you for an excellent meal. Went for my grandmother in law’s birthday, it was her first time and she really enjoyed it! We all did! The only issue we had was with the naan not being out with the appetizers we had. They waited till the food came out to bring it. Good, not great...and be advised that they don't have a lighted sign so it's a bit hard to find their location at night. This was a recommendation and it did not disappoint. I would definitely return and try something new although what I had was delicious. Bonus extras were eaten the next day and as good as the original! My colleague from India says it's the most authentic Indian restaurant in the area. It's delicious! The chicken saag that I first ordered when I visited this restaurant 20 years ago is no longer on the menu, but they'll still make it for you. This was the first place my wife and I ate when we started dating, so it holds a special place in our hearts. It was my mother’s 76th Bday and she was with her crew of 6 elderly Muslim women and they can’t stop talking about the food, the service, the space was clean. Thank you for making it wonderful! The rice was pre made, clumped together. Garlic nan was more like ghee-garlic cardboard. When mentioned to server, we were informed to tell them when ordering no ghee??? When presented with bill server did remove nan from bill, which was appreciated however, we would have preferred having it remade with just a little ghee and taken off bill. Yellow lentils served were very little portion and few lentils, more like 3oz of yellow soup. We will probably not return. Disinterested service really, average to below average food. I hadn't had Indian food for a while and had forgotten many of the dishes but the waiter was very helpful and attentive and helped us make our choices. I love hot food but my wife does not, so make sure that you check the spice level but again the waiter was very helpful. Dishes come with Naan and they're hot and newly made and scrumptious! I had the lamb vindaloo and my wife had the chicken tandoori masala and they were both delicious. Vindaloo is one of the hottest dishes on the menu which was fine with me. It's better to eat in a larger group so you can taste more dishes. We also had the spicy fried fish for appetizer and that was excellent. Prices for dinner were very reasonable and I understand from my wife that the lunchtime buffet is also great. Highly recommended! Best Indian food in NoVa! Always excellent food and friendly service. They were understanding when we came late. This is a hidden jewel for Indian food. Always excellent Indian food. Here with business people from India and they approved as authentic. While small and in a mall-type setting, the interior has a modern decor and does not feel cheap. Service is always deferential and effective. Decent selections of wine and beer. Good vegetarian options. I have always loved the food at Aditi and never been disappointed in the preparation. The Cosmos that we had before our meal were well made and a perfect accompaniment to Indian food. Several in my party had problems with spicy food and asked for non-spicy recommendations. However, even the non-spicy recommendations were too much for these people. I loved what I had - but then I like spicy Indian food. Nonetheless, we all took home doggy bags. Aditi has one of the better Indian buffets in the Fairfax County area. They have a good selection of vegetarian and meat dishes and everything is tasty. The price is a few dollars more expensive that its competitors, but prices on the buffet and regular menu are not so high that the average person can't afford it. The waiters are attentive and competent but not all over you. None of that annoying "Hi, I'm Kev and let's kick things off with some appe-teasers!" nonsense. Great food. I go w/ a fmaily of 5 and we're all highly satisfied. We've eaten Indian in Dubai, New York, Abu Dhabi, Japan and even India...this is right up there. Nice atmosphere. The prices are a bit high, but otherwise everything is great. Wash your meal down w/ Indian beer. Aditi proved to be an excellent find. It is located in a very large shopping mall and is in a section with several other restaurants. We ordered a thali (a selection of several items served in small bowls, along with rice, bread and a dessert) and a dosa. Both were excellent, well prepared, spicy (just right) and flavorful. The prices were reasonable. My husband and I have been regular customers at Aditi for years. We returned last weekend after a gap of almost two years and we were disappointed by our experience. It seems there has been some sort of management change and that was evident in their food and ambiance. First of all there was indian bollywood music in the background which really killed the ambiance. Before they used to have very soft instrumental music playing but this time there were loud songs. The food was also subpar. We ordered the Paneer Makhani and there were very few pieces of paneer and the gravy almost tasted like tomato soup and was very thing. We also ordered the pista kulfi and it was apparent that it was made with extra water, hence watering down the kulfi. All in all, it seems this place is doing things really cheap and it was evident in their food. We are not returning here again. We always enjoy going to Aditi's. The food is always good and they make the most delicious sauces for their dishes. This time we had the Father's Day buffet and they had a good variety of dishes to select from and the price was very reasonable. We look forward to going back. Great! From the service to the food. Especially the good. Authentic and generous portions. Went for a casual evening out and found Aditi to be a real treasure. The food was flavorful and appealing. The staff was friendly and very helpful. We will definitely return with additional friends. Excellent food and outstanding service as always!! Great experience! Will come back again! This was our 4th time visiting Aditi, but this time around the food was not as good as before. Either they changed their chef or we were served leftovers from lunch!!! Safely we will not be returning to this Indian restaurant! Great food, wonderful service, will come again! This is our favorite place for great Indian food. We haven’t been here in a few months, so we were very excited about the revamped menu, especially some dishes that we have been wanting but can’t easily find. We’re looking forward to returning. My husband and I recently returned to Aditi one of our old favorites. Wonderful dining experience as usual! Staff is still warm and welcoming. Not only was the food still outstanding they have added new delicious dishes as well! The Chicken Flatbread and the Chicken Tandoori Musallam are a must!! 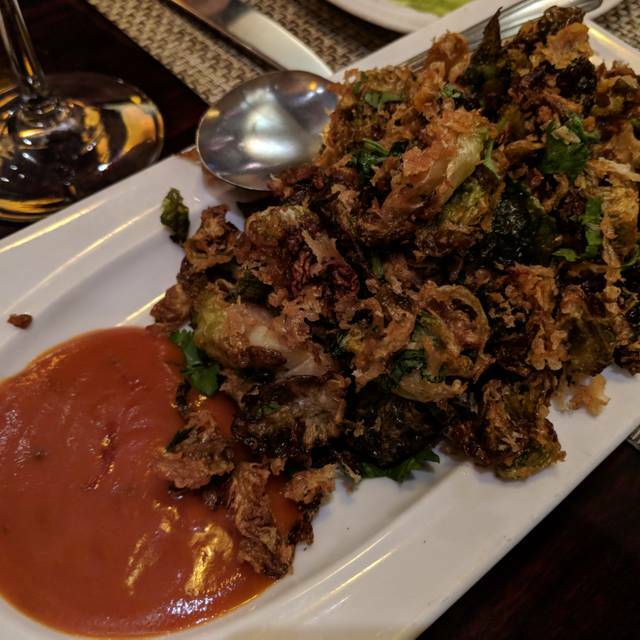 Aditi is still one of the best Indian restaurants in NOVA; we cannot wait to come back and try all the new amazing menu items!! The best Indian restaurant in the Springfield/Burke area. Great selection of authentic regional Indian dishes with outstanding vegetarian options. Impeccable service with friendly advice for dishes you have never tried. A great place for a leisurely meal with family or friends. Good wine and beer list. My friend chose Aditi because of the selection of vegetarian dishes. When I mentioned the restaurant, I hadn't realized it had a Sunday Brunch. We focused on the four hot vegetable dishes and the salad. There were several condiments. I loved the preserved lemon and the variety of bread. My friend and I both enjoyed the mango lassi flavored with bits of coriander. The place is family friendly. Aditi is a cozy and tasty retreat from the bustle of the shopping center it is in. They need more waitstaff on a Friday night. We waited at least 8 minutes before the server came to our table. I realize he had a ton of tables (pretty much our whole section) but I want to enjoy my food experience as well. We almost walked out but it smelled so good we decided to stay. Plus side - the food was delicious! Been coming for over a year. The good here is some of the best Indian you can find. However in the last few months the service has taken a turn to the downside with things being forgotten, not coming out in the right order, and unfortunately this time the food did not come out as hot as it usually does but instead to me it was slightly hotter than room temperature. I hope the service is addressed, as we have decided to take a break for a little while and hope the next time we come back things have been turned around.